Note: We've since re-imagined the process of managing Volume LTL and Truckload inside Freightview. We've released Spot Quoting with Freightview as a solution to help improve your workflow around quoting Volume LTLs and Truckloads. When you run a quote on Freightview, it retrieves your contracted rates directly from your carrier and broker websites. That works perfectly for most of your LTL shipments. When your shipment is a little heavier (over 5,000 lbs.) or bigger (over 5 pallets) than usual, you can get an even better rate by asking for a volume quote. With a volume quote, the carrier compares your need to imbalances in their network and offers you a special deal -- a one-time-only rate that's aggressively priced to win your business. Volume quotes can be great deals, but they can also be a pain to gather. While a few carriers offer volume quotes via their websites, all the rest require you to call or email. But Freightview makes it easy. 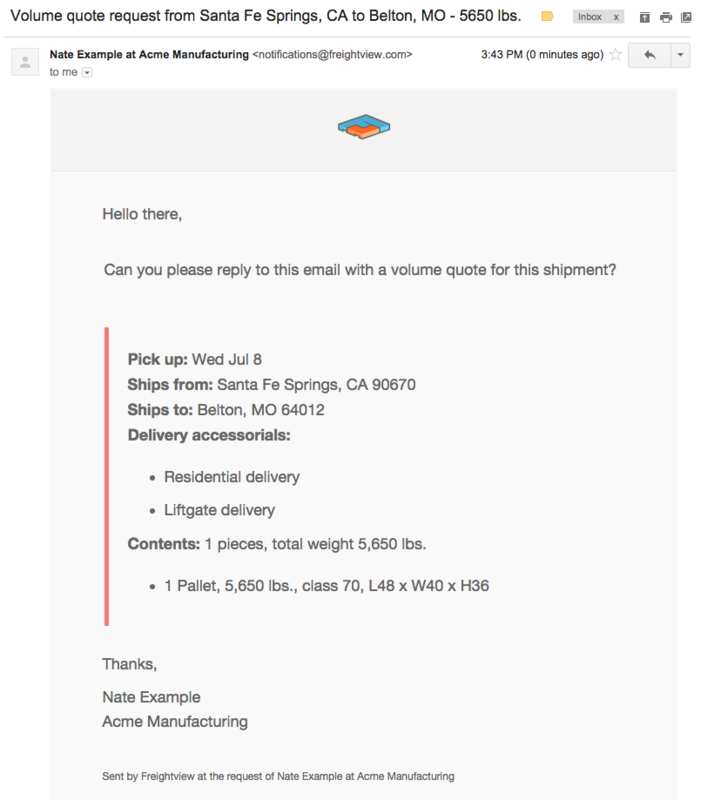 When you run a quote for a shipment that's big enough to qualify for a volume quote, we'll point out that there's an opportunity to save money. To send volume quote requests to your carriers, simply choose the ones you want and click to send. They'll reply to you so you can choose the one with the best deal, book it and send those savings straight to your bottom line. If you're a Freightview customer, try it on your next big shipment. If you haven't signed up for Freightview yet, what are you waiting for? Start your 30-day free trial today and see for yourself how Freightview redefines your relationship with shipping.